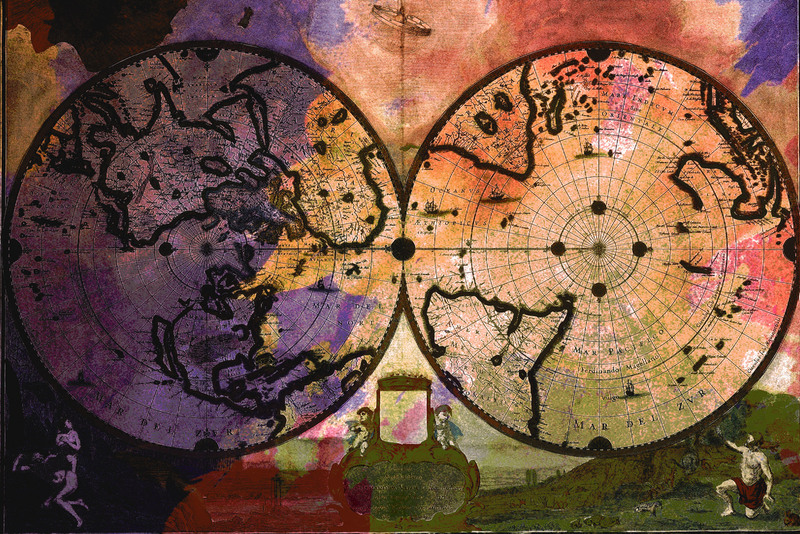 A philosophy shared by East and West: “Eternity exists in a moment and the whole world is in a speck of dust”. Thus, if one universe is a part of the bigger one, and if “all is one and one is all”, we can regard all ourselves as one — from the tiniest atom to the largest universe. This is the core message of my project about the ancient Eurasian wisdom which arrived in Japan 1300 – 1500 years ago via the Silk Road and even today survives in the form of art. 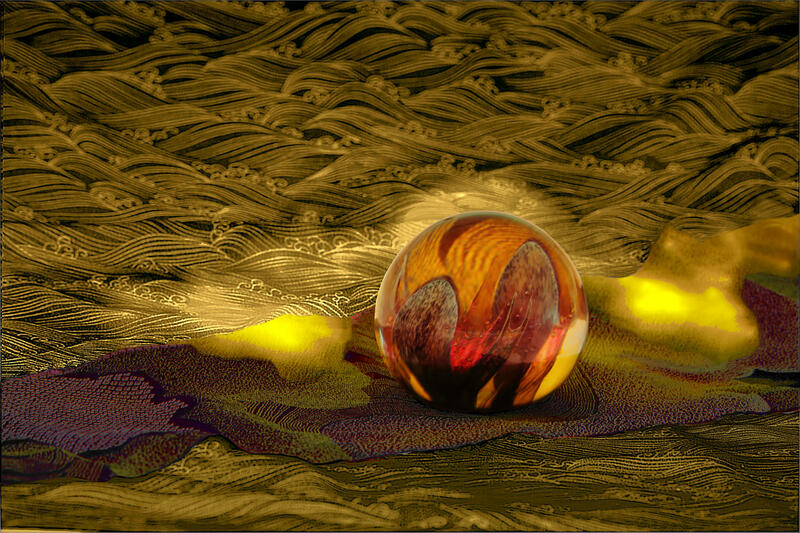 The purpose of this project is to present this Eurasian trail where beauty and wisdom interacted as both a “Road of Light and Hope” and “Road of the Vairocana Buddha’s introduction to Japan”, where this all-inclusive vision was created as an inspiration for a future in which everyone is a part of everything and all is interconnected. 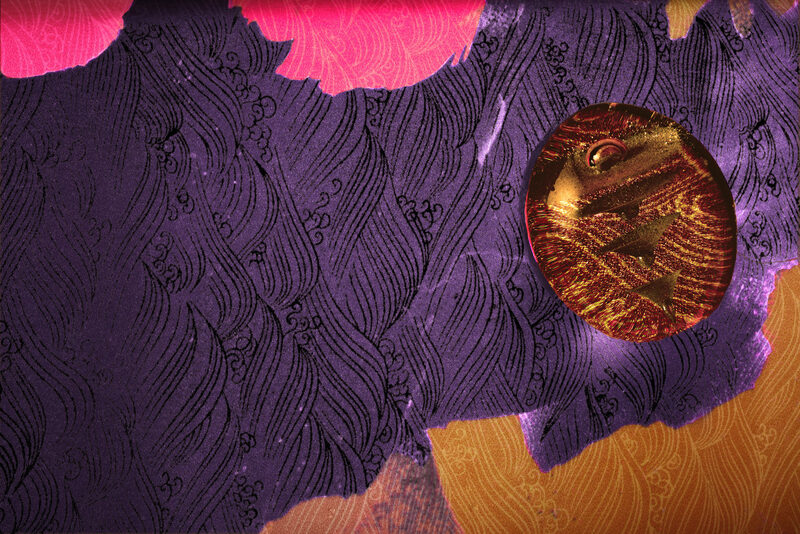 While Nara was the ancient capital of Japan, it was de facto the easternmost terminal of the Silk Roads. If we were to seek a cultural link connecting its westernmost terminus, Rome, with Nara, it might be found in the sculptural art work embodying the ideals of the human spirit as well as the free and vivid movements influenced by the classical style of ancient Greece. Some examples would be: Buddhist statues influenced by Hellenistic culture, e.g. the Vairocana Buddha whose origins can be found along the Silk Road; Gigaku masks whose origins can be traced back to the mask theater of ancient Greece, brought all the way to Japan via the “Oasis Silk Road” and the southwestern route, while becoming intermingled with the folklore and dance of Sogdians (middlemen along the trade routes); Bugaku masks that integrated diverse court performing arts from various ancient kingdoms, including India, Indonesia, Vietnam, China and Korea linked by the “Ocean Silk Road” crystallizing in this cultural heritage as our hope of realizing unity and solidarity: that is the quintessence of the cosmopolitanism of 13 centuries ago. Various hints and inspirations can be found in the histories of exchanges and fusions permeating the Silk Road that linked Europe, Asia and Arabia in one expansive network. While exploring the forgotten history of countless obscure exchanges of races and religions, philosophy and art & culture, folklore —through such cultural heritage as sculpture and masks, arts and crafts, ornaments and structures— I would like to search for a common ground fostering tolerance and solidarity in today’s divisive times. As a cue to inspire such awareness, I would like to propose the notion of a “Road of Light and Hope” as a message from the Silk Road of 20 centuries ago, tracing back from Nara to Rome —through art and media, under the motto: “The medium is the message” (M. McLuhan). For the sake of world peace, we embark on the mission of a generation through this project aspiring to share the notion of “media=art + message” transcending religious differences and racial disparities, via ancient visions of tolerance and solidarity traversing the Eurasian continent for over twenty centuries —reaching from Nara/Japan via China, India, Pakistan, Uzbekistan, Iran, Jordan, and Greece all the way to Rome — from the Eastern and Western termini of the Silk Road. This new “Road of Light and Hope” will connect the past and the present, the East and the West, —retracing the path to the common origin of our diverse cultures around the globe. 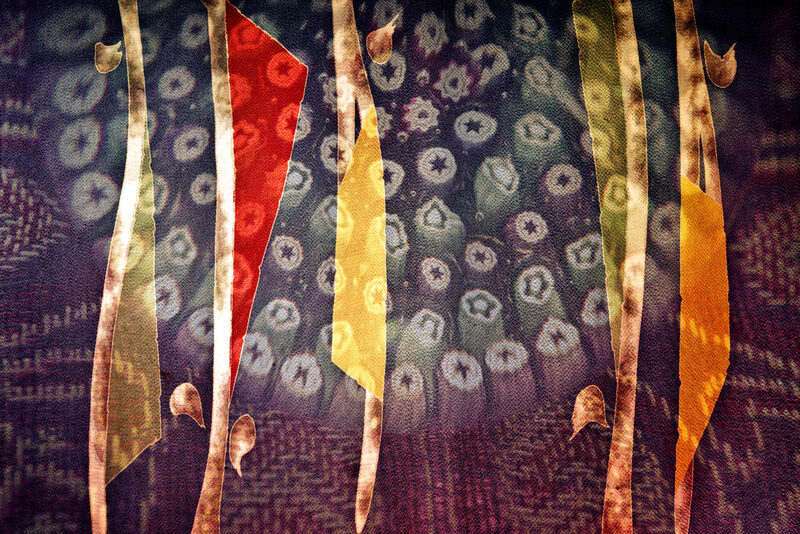 “Signs of the Intangible” is the collective title for our ongoing cross-media project comprising photographs, short films for screenings & installations and books, etc., entirely based on our own research and archives from 2002 to present. 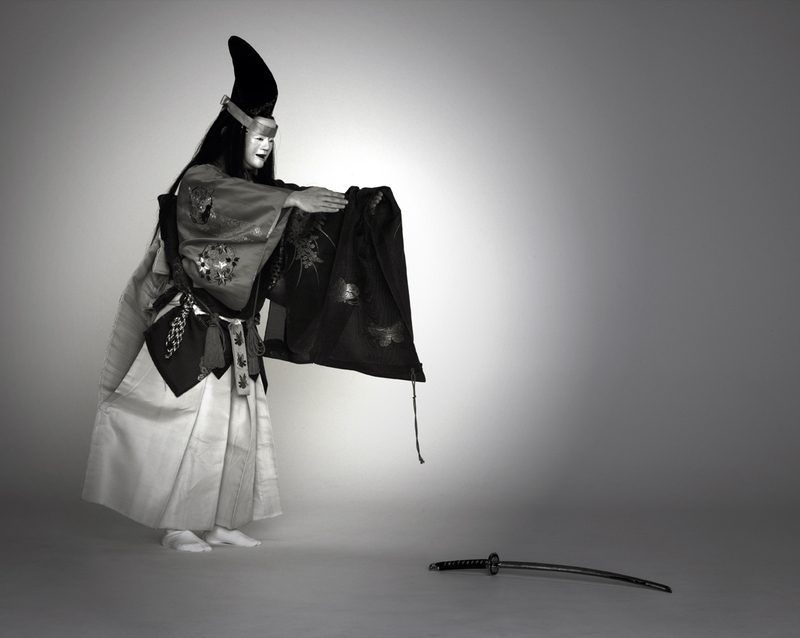 In an attempt to highlight the 1400 years of continuity in Japan’s performing arts, the presentation “Signs of the Intangible” features photographic art work of select National Treasures of Japan, as well as UNESCO Intangible Cultural Heritage such as Noh performers, or avant-garde Butoh dancers as well as topical film shorts by Miro Ito. The main objective of this commitment is to present the spiritual aspects of Japanese performing arts as forms of dedication. Nurtured in a nature worshipping environment (Shintoism) where everything is revered as kami (sacred deities) and influenced by Buddhism, the key element that provides such a long continuity is the dedicatory tradition which has been distinctly evident within the Shinto-Buddhist syncretism prevalent in Japan since the 7th century. 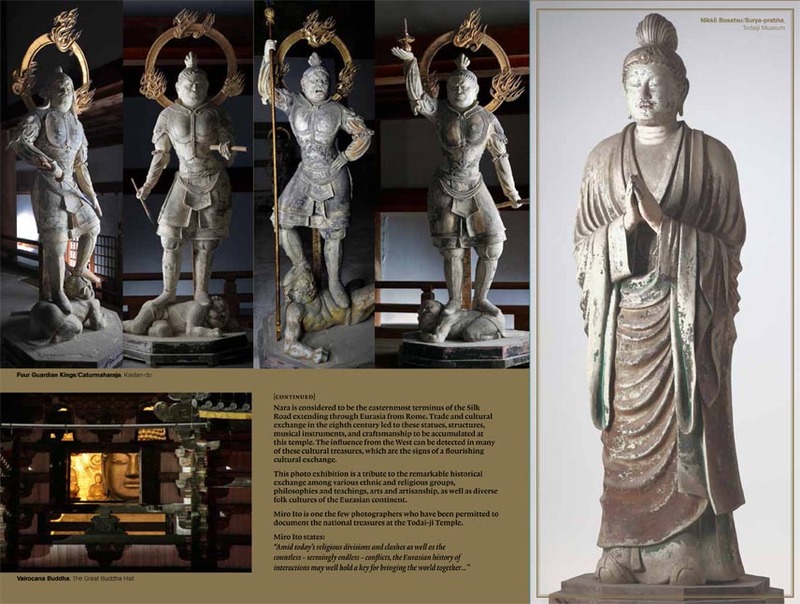 In addition, identifying dedicatory statues also as the archetype of Japan performing arts of Japan, “Signs of the Intangible” illustrates how Japanese performing arts have integrated and modified the cultural heritage of the Eurasian continent, originally thriving in the arts of Classical Greece while largely falling into disuse outside of Japan. Evidently, the origins of many Asian sculpting traditions can be traced back to statues (Άγαλμα) dedicated to ancient Greek deities. 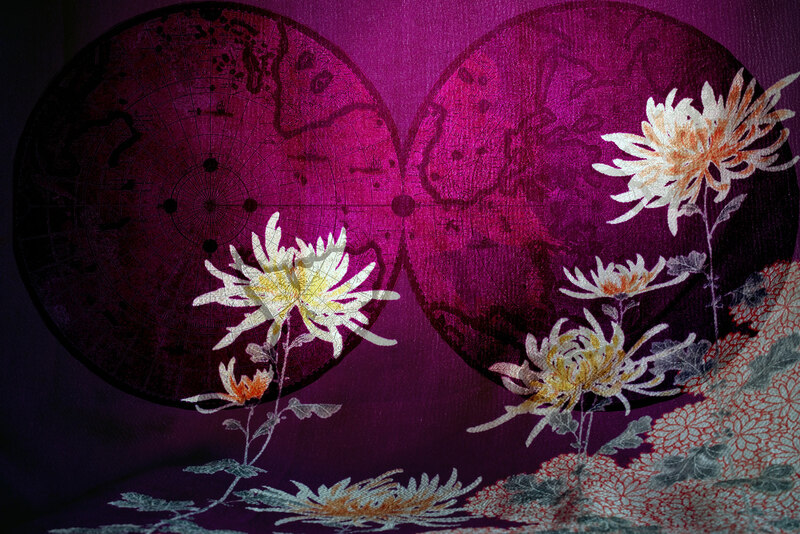 This presentation, “Signs of the Intangible” showcases an assortment outstanding artwork as evidence of the inter- connectedness of East and West. Furthermore, Asian holistic ideals of mind-body unity as a path to enlightenment has been cultivated— not only in religious contexts, but also —- in performing arts like Noh and in martial arts, as Kobudo, under the patronage of the samurai clans that inherited the shogunate, with Zen Buddhism influences from the 12th century onward, down to contemporary Butoh dances and performances. It is anticipated, that such an awareness will ultimately foster a mind-set of mutual understanding that transcends race and creed, disparities and differences, and is conducive to promoting peaceful coexistence among all of us. Ancillary projects such as photo exhibitions, cultural exchanges, academic research projects are being proposed to museums, libraries, universities and educational institutions, etc. The following are objectives for constructive collaborations. 1. 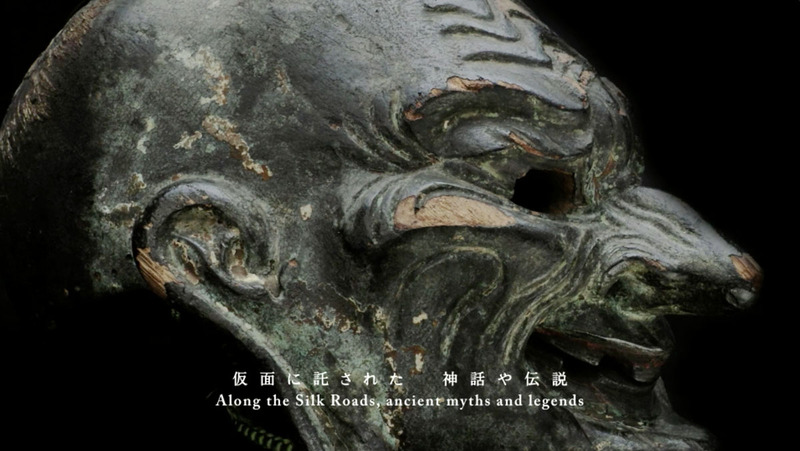 Collaborations with curators and academics in lectures and events integrating photography and media-art & movie-installations/screenings presenting gigaku masks and bugaku, ancient Asian court theatre arts that entered Japan via the Silk Roads. 2. 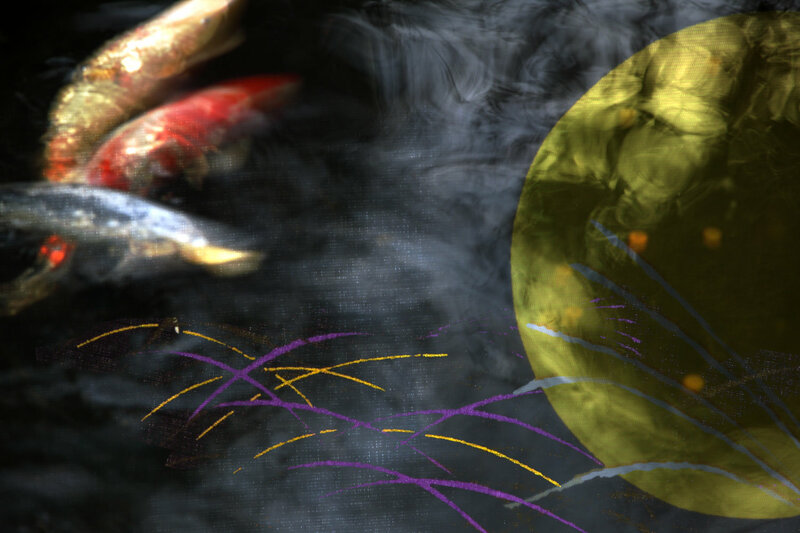 Examining how the origins of 600 years of such traditional performing arts as noh and kyogen and their connections with Zen, and contemporary butoh, have been seen, studied and presented by educational and cultural entities in the world. 3. Identifying common ground with International performing arts institutes as well as artists & creators that endeavor to create theatrical performances inspired by above-mentioned traditional and contemporary performing arts of Japan and Asia in the more extended context of the global performing art scene. This touring exhibition & screenings series, entitled “Road of Light and Hope” began at the United Nations HQ in New York in 2016. It was followed up by exhibitions at the Academy of Arts of Uzbekistan (the Ikuo Hirayama International Caravanserai of Cultures) in Tashkent, the Council of Europe’s HQ as well as at le Lieu d’ Europe in Strasbourg, later that same year. Most recently it was presented at the JIC Hall of the Japanese Consulate General in Chicago, after being shown at the Japan Foundation in Toronto for three and a half months in 2017. Exhibits of photo art works in traditional hanging scroll style are being created by Miro Ito who, after experiencing 9/11 in New York firsthand, has been pursuing themes of the World Cultural Heritage and National Treasures in Nara, aspiring to serve as a bridge of the heart and mind between East and West. The portrayed treasures are preserved in Nara at the Tōdai-ji Temple and the Kasuga-taisha Shrine which respectively are part of the UNESCO World Cultural Heritage Site: Historic Monuments of Ancient Nara. These are extremely rare images, as many of the portrayed artifacts have not been photographed during the last 40 years or more. The next venues will be the Japanese Embassies in Washington D.C and Ottawa respectively, whereby the latter is in the context of the 90th anniversary of Japan-Canada diplomatic relations which is being commemorated in 2018. “Road of Light and Hope” is also invited to Rio de Janeiro for the 110th anniversary of Japanese immigration to Brazil (tentatively for the Japan Week in July). Bonjour, mesdames et messieurs, Guten Tag, verehrte Damen und Herren! Good Afternoon,ladies and gentlemen! First of all I’d like to extend my heartfelt gratitude for the kind invitation of the Consulate General of Japan in Strasbourg as well as the Council of Europe by which this exhibition “Road of Light and Hope” could be realized here in the heart of Europe, where we can sense the justice and humanity of the European Union. The core message of “Road of Light and Hope” refers to the ancient Eurasian wisdom which arrived in Japan 1300 years ago, via the Silk Road, and even today survives in the form of art. This wisdom shared by East and West can be found in a philosophy like: “Eternity exists in a moment and the whole world is contained in a speck of dust”. Thus, if one universe is a part of the bigger one, and if “all is one and one is all”, we can regard all ourselves as one — from the tiniest atom to the largest universe. This wisdom came to Japan as a core teaching of Hua-yen Buddhism, the fundamental philosophy behind the Great Buddha statue, built 1300 years ago, that has some commonality with the Neo-Platonism in ancient Greece. While Nara was the capital of Japan, it was de facto the easternmost terminal of the Silk Road. If we were to seek a bridge connecting its westernmost terminus, Rome, with Nara, it might be found in the sculptural art work, embodying the ideals of the human spirit, as well as the free and vivid movements influenced by the classical style of ancient Greece. Various hints and inspirations can be found in the histories of numerous exchanges and fusions permeating the Silk Roads that linked Europe, Asia and Arabia in one expansive network. Through the exploration of this all-inclusive interconnectedness —from ancient times— of all of us, I would like to search for a common ground that will foster tolerance and solidarity in our time. 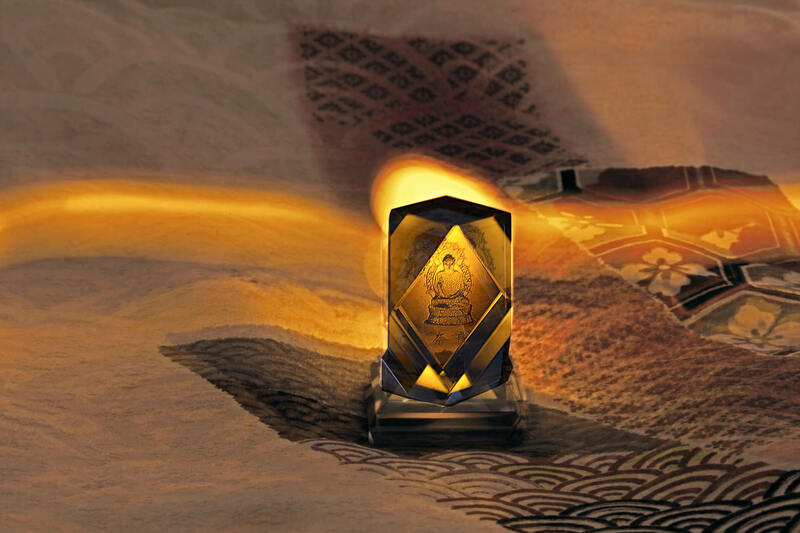 As a cue to inspire such awareness, I would like to propose the notion of a “Road of Light and Hope” as a message from the Silk Road of 13 centuries ago, tracing back from Nara to Rome. 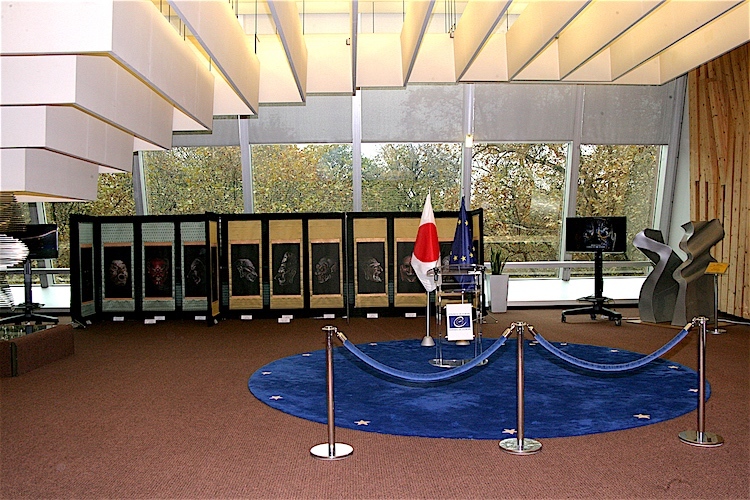 On this occasion of the 20th anniversary of Japan’s attaining Observer Status at the Council of Europe, it is a great honour to have my humble exhibition presented here. Thank you! Danke schoen! Merci! This is the core message of my project about the ancient Eurasian wisdom which arrived in Japan 1300 – 1500 years ago via the Silk Road and even today survives in the form of art. 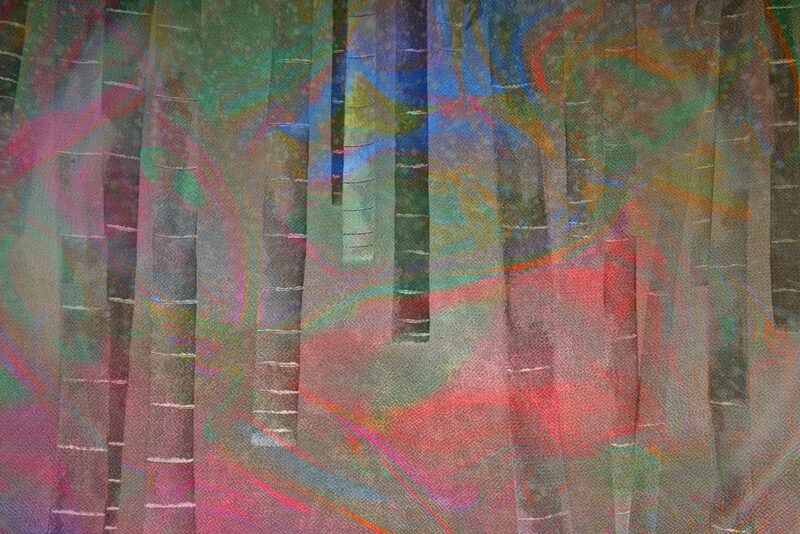 The purpose of this project is to present this Eurasian trail where beauty and wisdom interacted as both a “Road of Light and Hope” and “Road of the Vairocana Buddha’s introduction to Japan”, where this all-inclusive vision was created as an inspiration for a future in which everyone is truly feels they are a part of everything and all seems interconnected. While Nara was the ancient capital of Japan, it was de facto the easternmost terminal of the Silk Roads. If we were to seek a bridge connecting its westernmost terminus, Rome, with Nara, it might be found in the sculptural art work embodying the ideals of the human spirit as well as the free and vivid movements influenced by the classical style of ancient Greece. Some examples would be: Buddhist statues influenced by Hellenistic culture, e.g. 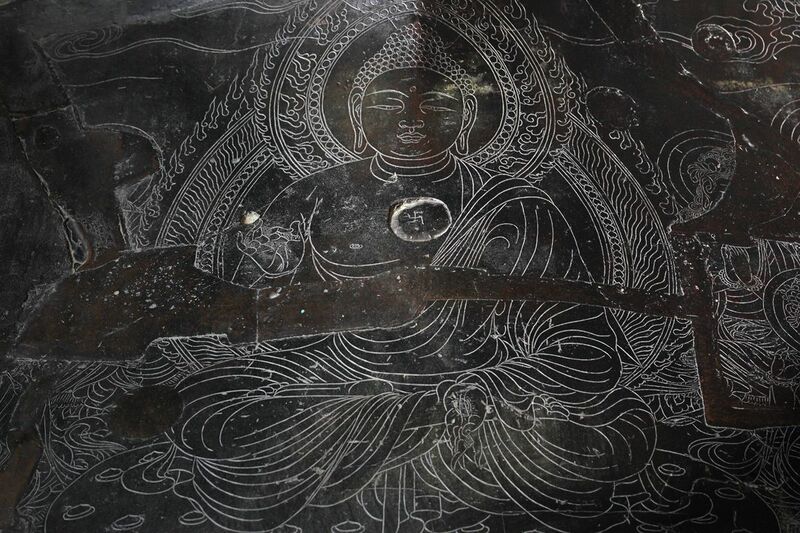 the Vairocana Buddha whose origins can be found along the Silk Road; Gigaku masks whose origins can be traced back to the mask theater of ancient Greece, brought all the way to Japan via the “Oasis Silk Road” and the southwestern route, while becoming intermingled with the folklore and dance of Sogdians (middlemen along the trade routes), and mask theaters in Tibet or Bhutan; Bugaku masks that integrated diverse court performing arts from various ancient kingdoms, including India, Indonesia, Vietnam, China and Korea linked by the “Ocean Silk Road” crystallizing in this cultural heritage as our hope of realizing unity and solidarity: that is the quintessence of the cosmopolitanism of 13 centuries ago. 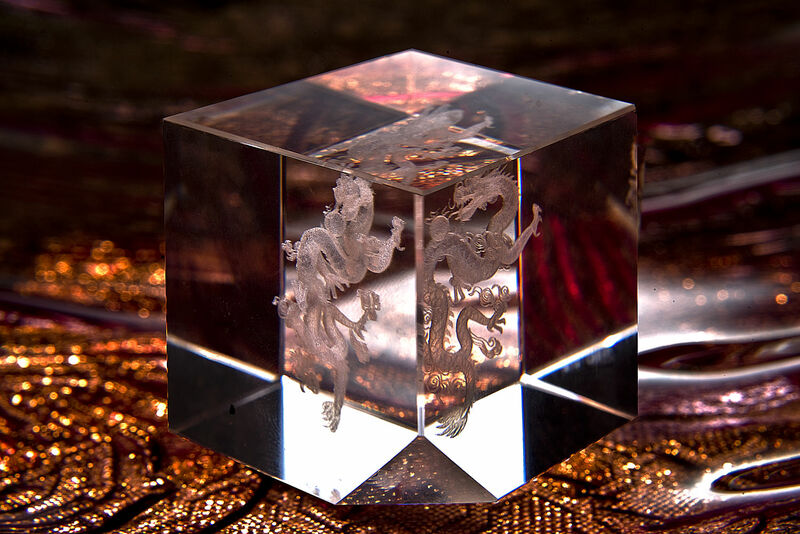 Various hints and inspirations can be found in the histories of exchanges and fusions permeating the Silk Roads that linked Europe, Asia and Arabia in one expansive network. While exploring the virtually unknown history of numerous exchanges of races and religions, philosophy and art & culture, folklore —through such cultural heritage as sculpture and masks, arts and crafts, ornaments and structures— I would like to search for our common ground fostering tolerance and solidarity in our contemporary times. As a cue to inspire such awareness, I would like to propose the notion of a “Road of Light and Hope” as a message from the Silk Road of 13 centuries ago, tracing back from Nara to Roma —through art and media, under the motto: “The medium is the message” (M.McLuhan). This exhibition was shown at the NY Public Library for Performing Arts (Lincoln Center) in 2007/2008, as a tie-in exhibition of the NY Butoh Festival. It is my understanding that the body is the very “dimension of the soul” and the “soul is the dimension of the body” (Hakuin, Zen Master) where changing and recurring finite life encounter the sacred dimension. In order to focus on this subject, I started to photograph body expressions of prayer and dedication in Japan. An initial result in the United States was a solo-exhibition of mine that contrasted noh andbutoh: “Men at Dance: from Noh to Butoh” at the NY Public Library for the Performing Arts (Lincoln Center) in 2007/2008, as a tie-up exhibition to the NY Butoh Festival (supported by the NY Consulate General as well as the Japan Foundation). In a sense noh serves as a linking passageway (hashikagari) bridging the worldly and the divine – beyond the abyss and dichotomy of many centuries of diverse spiritual traditions in Japan. As the origins of noh can be traced back to devotion by jushi in Buddhist rituals (in the syncretization of Shinto with Buddhism) in the 8th century, it thus created a drama of salvation for the soul within a Buddhist context. In contrast to the hyper-stylized aesthetics of noh as “living statues”, characterized by their highly-sophisticated abstraction and symbolism, butoh was conceived in the 1950s —over 600 years after Kan’ami & Zeami (the great Noh develovers in the 14-15th century) — to become the leading contemporary performing art in Japan. Butoh suggests the vulnerability of the changing and falling body looks like an entirely different type of nature from the noh performances in a viewpoint of body expression. 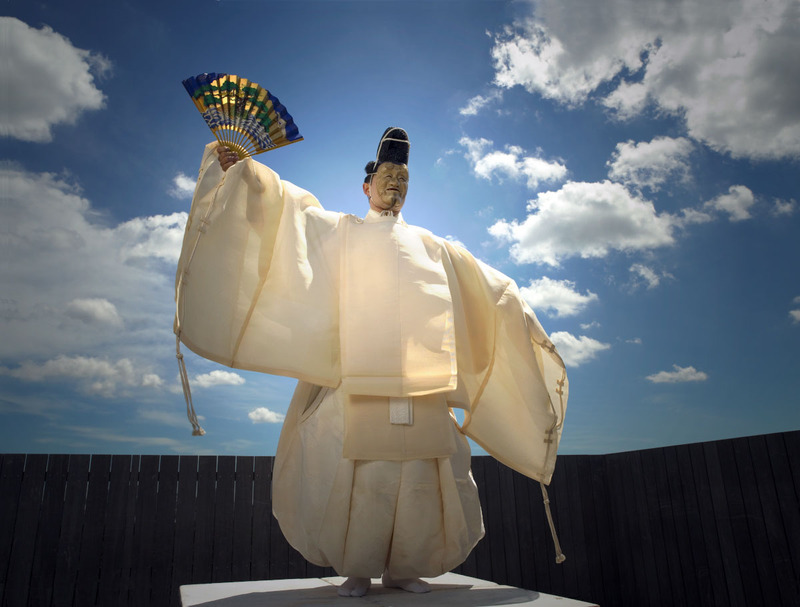 Comparing with noh, butohperformance is overwhelmingly expressionistic; so much so that its erratic minimalist motion can be regarded as an alternative form of body motion on an inner quest interacting with the subconscious. 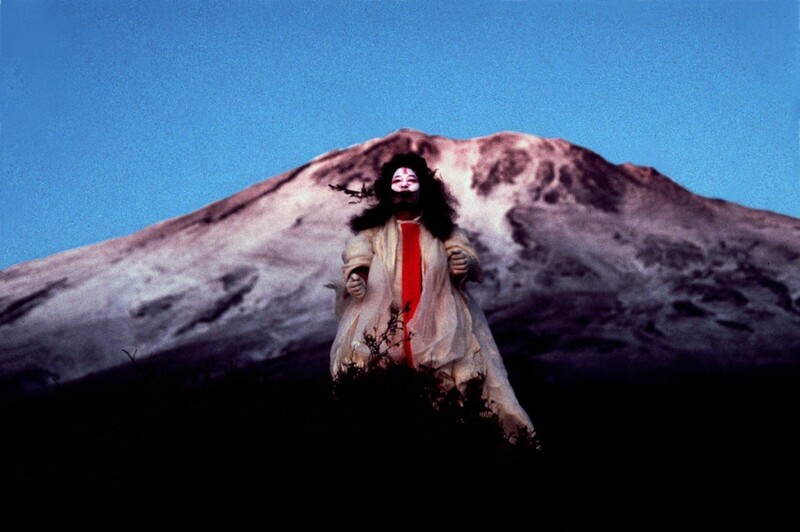 In a sense, butoh reflects the traditional common Japanese perception of the body-and-soul scapes (心身一如）with noh, where the way of life with prayer and dedication, Japanese philosophy on how to live and die, a hope for salvation, are deeply related in the horizon of spirituality. Noh and butoh invite us to the invisible world ruled by connotations of silence and convergence. Innoh theater, “metamorphosis with masks” plays a central role, where the humans become deities, spirits and demons. 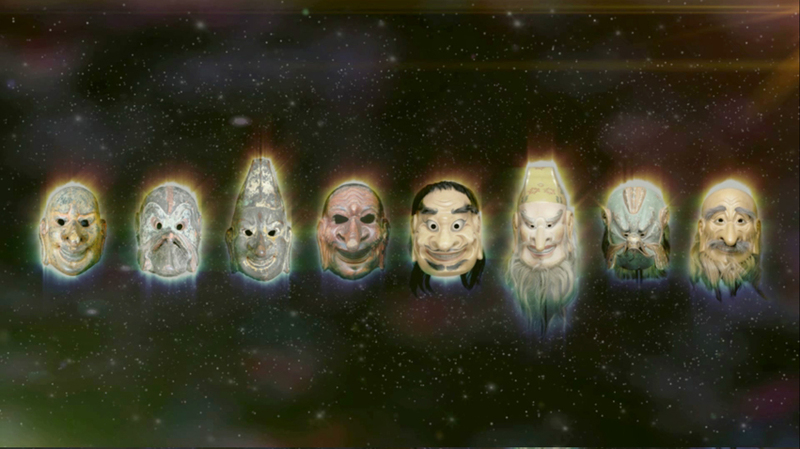 Masks are yorishiro where sacredness is believed to manifest itself and concurrently function as means of transforming into supernatural beings, while serving as the sacred interface between the earth world and the Beyond. All exhibits (55 works) of Miro Ito’s exhibition; Men at Dance — from Noh to Butoh. 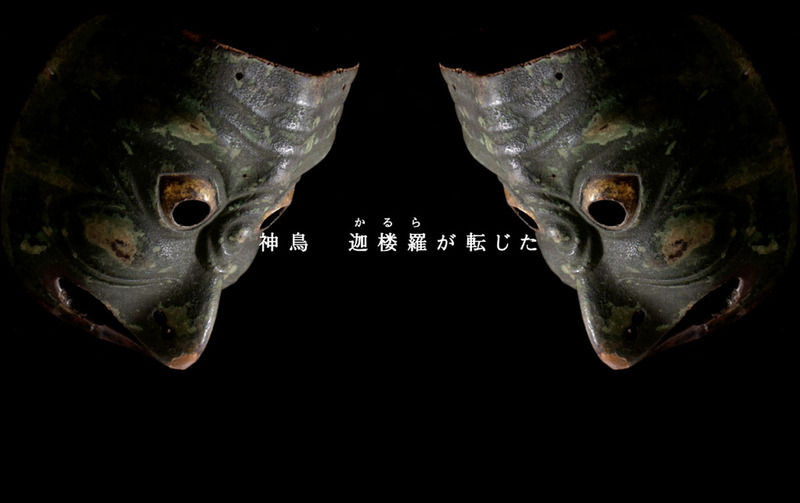 All exibits (65 woks) of “Kamen, Gakugeki, Inochi (Masks, Performance, Life’s Energy)” featuring Mannojo Nomura V.
Individuals: Kosei Morimoto (Abbot Emeritus of Tōdaiji Temple), Kan’ichi Kasagi (Director of Performance and Music of Nantogakuso Gagaku Troupe, Professor Emeritus of Nara University), Kiyotaka Kimura (Professor Emeritus of Tokyo University, former President of Tsurumi University), etc. Permanent Mission of Japan to UN, Consulate General of Japan in Strasbourg, Japan Foundation Toronto, Japan Camera Industry Institute (JCII), Academy of Arts of Uzbekistan, NY Public Library for Performing Arts, Canon Group, Association for Commemorative Events of the 1300th Anniversary of Nara Heijō- kyō, Nara Prefecture, Act JT, Tokyo Broadcasting System Television, Japanese Cultural Week in Frankfurt, etc. Embassy of Japan in Uzbekistan, Consulate-General of Japan in New York, Association for Commemorative Events of the 1300th Anniversary of Nara Heijō- kyō, Nara City Tourism Association, etc. Canon Marketing Japan, Iino Mediapro, Japan Camera Museum, etc. Nara Institute of Science and Technology / Information Science / Professor Chihara’s Laboratory (2009−2010), etc. Canon U.S.A., Nippon Care Communications, ND Software, Nippon Computer Systems, Agfa Gevaert Japan, Bank of Tokyo-Mistubishi in Germany (present Bank of Tokyo-Mitsubishi UFJ), All Nippon Airways (ANA), etc.